Bowling Green started the second half of the season with plenty of promise. Now, the Falcons are fighting to save their season. They dropped their third game Saturday night, losing a 4-3 decision to Northern Michigan in the Ice Arena. The Wildcats scored rallied for four goals in the final 26 minutes to erase a 3-0 deficit. Justin Rose, a fourth-line junior left wing, was credited with the winning goal with 4:22 remaining. Rose’s pass, from the left side of the crease, deflected into the net off the skate of BG senior captain Dan DeSalvo, who was on right side of the crease. The goal was Rose’s first of his career and it was his first point of the season. The Falcons held a 3-1 lead after two periods, but NMU’s Reed Steckel scored twice to tie the game. He cut the lead to one just 63 seconds into the third period and tied the game on the power play with 7:57 remaining. BG lost a third-period lead for the second straight game. The Falcons held a 1-0 lead after two periods Friday, but Ferris rallied for a 3-2 overtime win. BG scored to take a 2-1 lead with just 2:23 remaining. Ferris then tied the game just 27 seconds later. BG entered the series 17-2-4 when it was leading or tied after two periods, including a 12-1-3 mark when leading after two. SECOND HALF: BG is only 6-6-2 in its last 14 Western Collegiate Hockey Association league games — 12 of the games coming against teams below it in the standings. 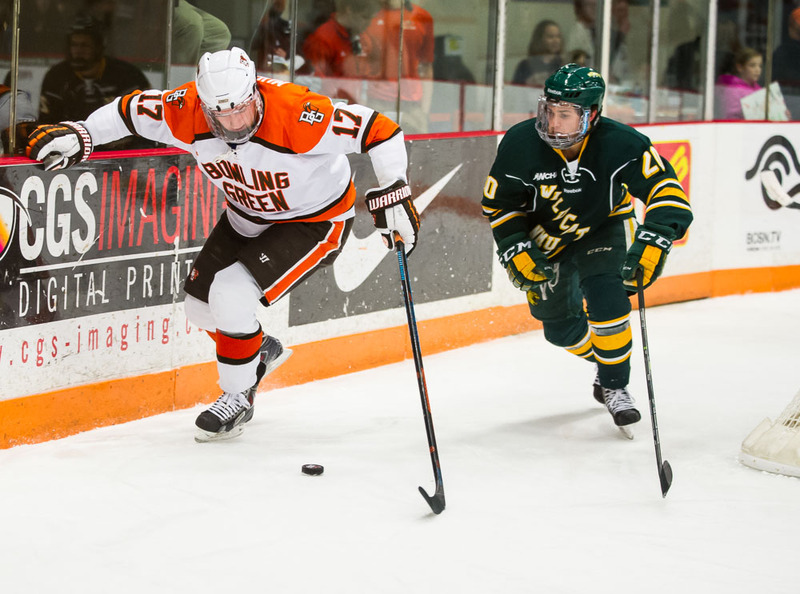 The Falcons, who were 8-1-1 in the league entering Christmas, are 18-9-5 overall and 14-7-3 in the WCHA. BG was ranked eighth nationally entering the week. WCHA: The Falcons are third in the WCHA with 31 points and still need one point to clinch a home-ice berth for the league quarterfinals. BG was fourth in the league coaches poll. Minnesota State leads the WCHA with 40 points, one ahead of Tech and nine ahead of BG. Minnesota State hosts Tech next weekend. The Falcons still can tie Tech for second, but Tech would earn the No. 2 seed for the playoffs, based on its having more league wins than the Falcons. BG can finish as low as fifth. NMU and Bemidji State are tied for the final home-ice berth with 24 points, two ahead of Ferris State. 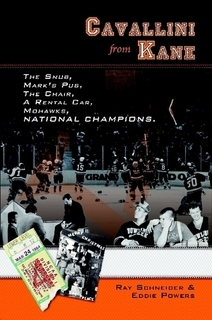 The top four seeds host quarterfinal series in the first round of the WCHA playoffs. Every team in the league has four games remaining entering the final two weekends of the regular season. PAIRWISE: The Falcons fell to 13th in the Pairwise Rankings, which mirror the selection criteria for the NCAA playoffs. Sixteen teams advance to the NCAAs, including the six league playoff champions. Being 13th in the Pairwise means the Falcons can’t afford many more losses if they’re to earn an at-large berth to the NCAAs. They also have to hope teams outside the top 16 in the Pairwise don’t win those league playoff titles. COLLAPSE: BG built its 3-0 lead on goals from Mitch McLain and Brent Tate in the first period, and Mark Cooper in the second period. The Falcons held a 23-12 edge in shots during the first two periods, but they had only four shots during the final 20 minutes. NMU came on strong in the third period, totaling 10 of its 22 shots. “We stopped playing,” Bergeron said. “Four shots in the third period with a two-goal lead is not very good. It’s as much mental as it is physical. Once NMU cut the lead to 3-1 on Gerard Hanson’s goal with 5:05 left in the second period after a Falcon turnover in the neutral zone, BG never regained the momentum. PENALTIES: The Falcons took three penalties in an eight-minute span of the third period, helping NMU’s comeback. All of three penalties came from players who are part of BG’s leadership group — Brent Tate, Pierre-Luc Mercier and DeSalvo. The power-play attempts through two periods were 4-1 in favor of BG. The Falcon power play finished 2 of 5 in the game, while NMU was 1 of 4. DeSalvo was a minus-3 in the game, while classmates Adam Berkle and Mike Sullivan were minus-2. Junior Jose Delgadillo and sophomore Mercier also were minius-2. All five were on the ice for the winning goal. “Our leadership needs to be able to handle those situations and move forward,” Bergeron said. “The coaches aren’t out there skating. We can call timeouts or use TV timeouts to right the ship. GOALTENDING: Bergeron wasn’t pleased with the goaltending of junior Tommy Burke and freshman Chris Nell in the series. Burke stopped just 21 of 24 shots Friday. Nell stopped only 18 of 22 shots Saturday. That could mean sophomore Tomas Sholl, whose last start came Jan. 10, will receive a start next weekend at Alaska-Anchorage. Sholl has a 2.58 goals-against average and a .909 save percentage in just five games. Sholl stopped just 6 of 8 shots in 16:38 in his last start against Alaska (Fairbanks) before he was pulled. Burke has a 2.13 goals-against and a .915 save percentage in 16 games. Nell has a 2.14 goals-against and a .923 save percentage in 12 games. However, Nell is only 0-4-1 in his last five games. NMU’s Michael Doan stopped 61 of 66 shots in the series. PP: The BG power play was 2 of 5 in the game. Brent Tate and Mark Cooper had the man-advantage goals for the Falcons. Tate’s power-play goal at 17:28 of the first period was BG’s first since Jan. 24 against Lake Superior. The Falcons hadn’t scored a power-play goal in the last seven games, a span of 25 chances. BG was scoreless on its last 27 attempts with the extra man before Tate scored. “There’s still holes there,” Bergeron said of the power play. “We’re still fighting the confidence thing a little bit, they’ll (the players) say … that’s only an excuse. PK: The BG penalty-killing still ranks first nationally at 92.7 percent, even though it was just 5 of 7 in the series. FINALLY: Cooper’s goal was his third of the season, the other two coming at Alaska (Fairbanks) Nov. 7-8. He scored in each game at Fairbanks. LINEUP: In addition to starting Nell in goal, BG made three other lineup changes for Game 2 of the series. Jakob Reichert replaced Brett D’Andrea at forward, and Sullivan and Delgadillo replaced Connor Kucera and Braden Pears on defense. NMU: The Wildcats remained without two key players in the series because of undisclosed injuries — sophomore goalie Mathias Dahlstrom and forward Dominik Shine. Dahlstrom has a 2.18 goals-against and a .924 save percentage in 21 games. Shine entered the game as NMU’s second-leading scorer, totaling seven goals and 11 assists in 22 games. NMU then lost two more key players during Saturday’s game. Hanson, a sophomore forward, did not return from a badly cut leg four minutes into the third period. Hanson scored the Wildcats’ first goal of the game. He has five goals and 13 assists in 32 games. And NMU lost senior captain and defenseman Jake Weber to a game-misconduct penalty for checking from behind with 11:46 remaining in the second period. NEXT: The Falcons visit Alaska-Anchorage (7-19-4, 4-18-2) for games Friday and Saturday nights at 11:07. The Seawolves are last in the league with 10 points, three behind Lake Superior for the final playoff spot. Each team has four games remaining. UAA has lost eight games, including 3-2 and 3-1 losses at Bemidji over the weekend.